Comprehensive Cloud Backup Solutions - ASUSTOR Inc.
A variety of different NAS products can be found on the market, from entry-level devices to enterprise-class models. NAS devices offer an impressive array of functions, but their primary function is still storage and backup. Anyone who has experienced a computer crash or lost a cell phone can remember the pain of losing their data and can vouch for the importance of data backup. ASUSTOR NAS provides users with a comprehensive array of backup features, allowing all users to easily and flexibly centralize the backup of all their data that is spread out amongst their various digital devices. Today, almost everyone uses a computer, whether at home or at work. No matter if you’re using Windows or OS X operating systems, all your important data must be backed up in order to safeguard against any accidents. 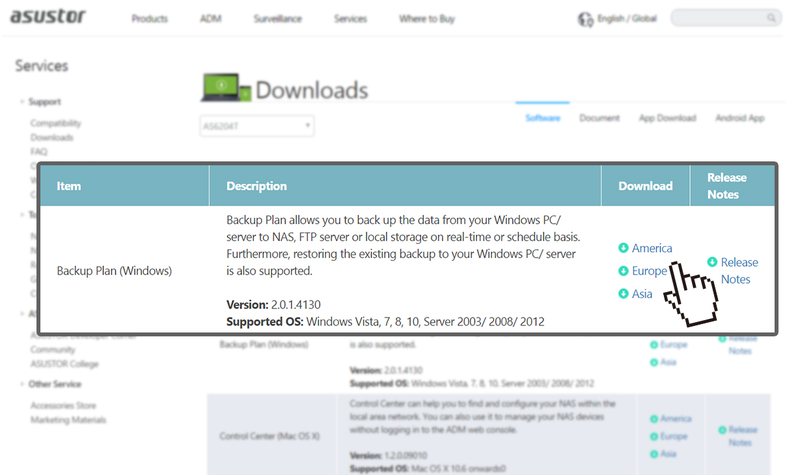 For Windows users, ASUSTOR NAS provides the Backup Plan utility that allows them to easily backup data from Windows PCs or servers to an ASUSTOR NAS. 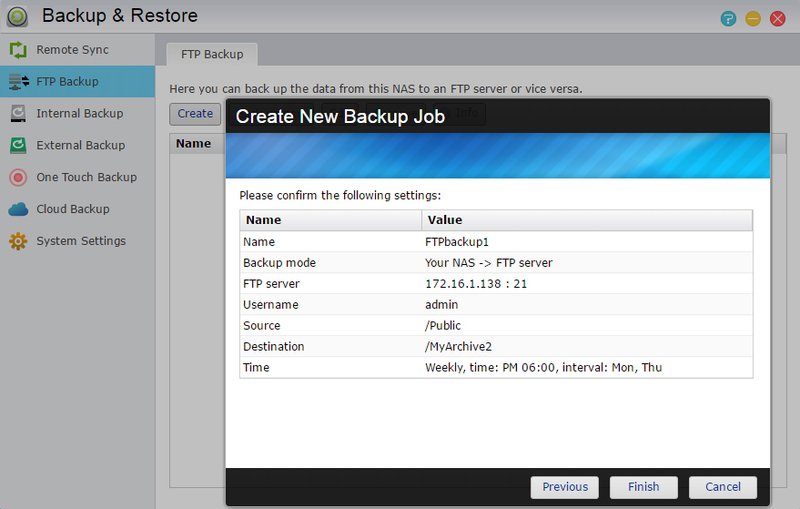 For Mac users, ASUSTOR NAS features Time Machine support. Users need only enable Time Machine support on the NAS to begin backing up data from their Mac to their NAS via Time Machine. Users can also easily restore the data to their Mac when needed. With ASUSTOR NAS, different Mac users are also able to use independent accounts and backup locations to back up their data on the same NAS, guaranteeing privacy for all. 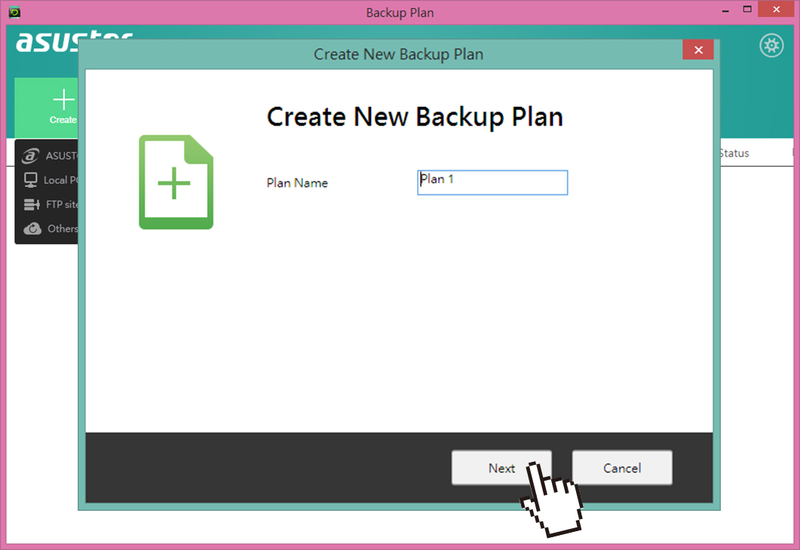 Create a backup task and follow the provided steps to complete configurations. 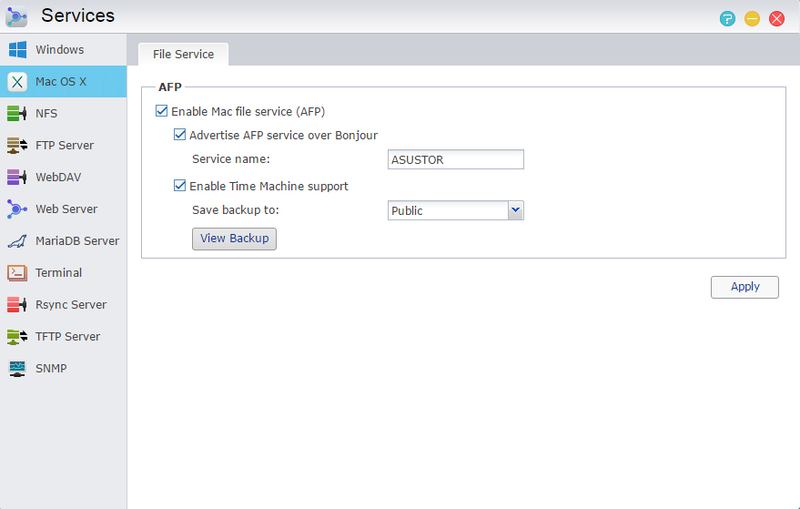 ASUSTOR’s ADM provides built-in Time Machine support. MyArchive is an exclusive storage technology on ASUSTOR NAS that utilizes 1 to 2 disk bays on the NAS to create MyArchive hard disks. MyArchive disks are can be thought of as individual storage spaces that can be removed or plugged into the NAS when needed. MyArchive disks make use of the local SATA interface on the NAS, providing transfer speeds of 6GB/s which is much faster when compared to external storage devices. The removable nature of MyArchive disks also allows for convenient organization, with different types of data being backed up to different disks. 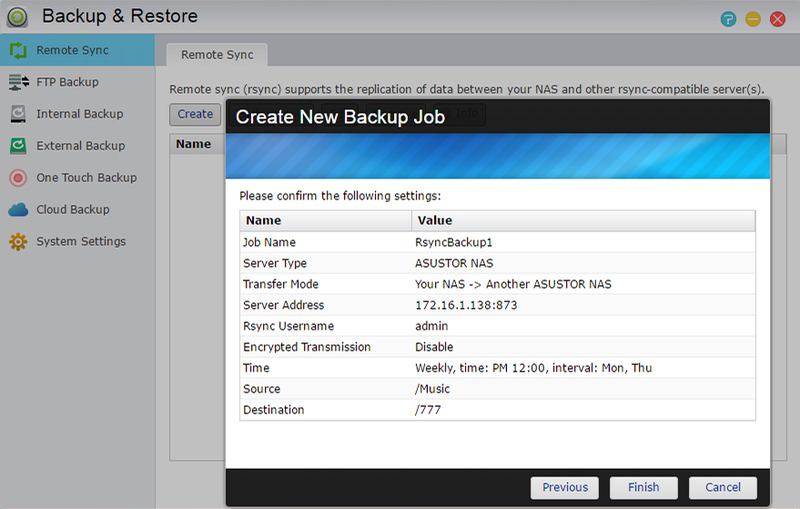 MyArchive disks can also be plugged into any other ASUSTOR NAS devices for further data sharing or backup. 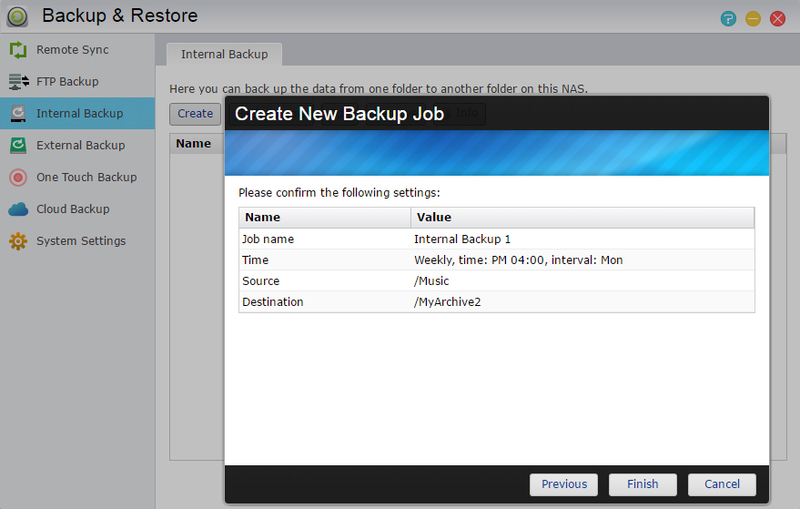 Furthermore, when combined with ASUSTOR’s local backup function, users can configure scheduled backups of internal NAS folders to MyArchive disks. 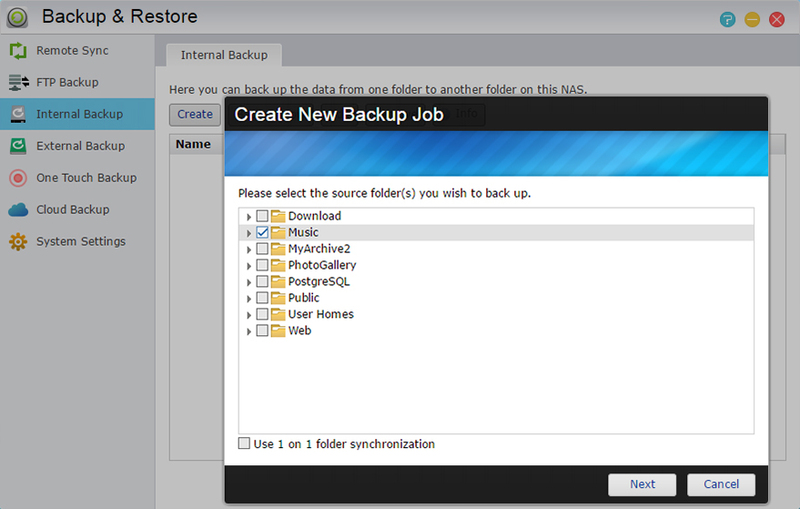 Select a backup source folder and complete configurations according to the steps provided. Using this task as an example, you can see that backup has been configured from the Music folder to the MyArchive2 folder for every Monday afternoon at 4:00 PM. For both enterprise and individual users, FTP is a convenient and commonly used file transfer tool. FTP backup jobs can be configured for immediate backup or as scheduled backups. ASUSTOR NAS also provides 2-way transfer support allowing data to be backed up to the NAS or from the NAS to a different server. 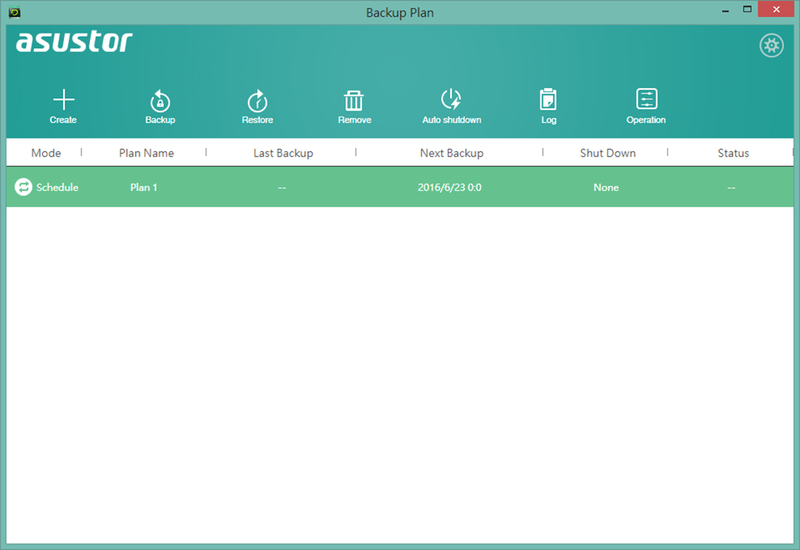 Additionally, ASUSTOR's Mission Mode allows users to configure the number of connection attempts and time interval for connection attempts for a particular backup job, ensuring for successful completion. In addition to a simple quick connection, advanced settings allow users to configure a login mode and transfer mode. After competing configurations, they will be summarized for the user as seen in this graphic. Rsync is a type of transfer protocol that is commonly for backup and syncing between two computers. By providing block level replication, Rsync is able to offer incremental backup. Incremental backup allows for successive backup jobs (after your first backup job) to only copy data that has changed since your last backup job. Rsync is suitable for use with files and data that are always changing. It lets you cut down on backup time while significantly reducing bandwidth usage. 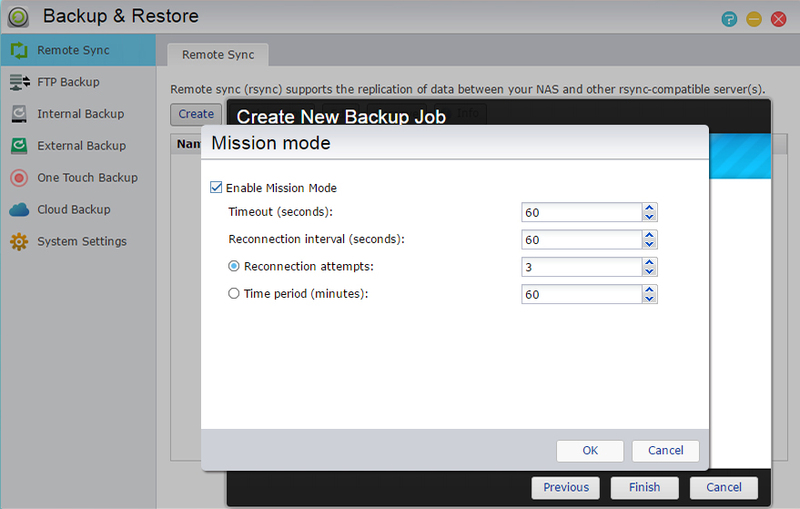 As ASUSTOR NAS supports both incremental and encrypted backup, it is able to provide decreased backup times and data security which is essential for business users. Additionally, 2-way backup, Mission Mode and scheduled automatic backups can be utilized to significantly lighten the workload of IT staff. Mission Mode allows you to configure the number of connection attempts and time interval for connection attempts. You can see that this task has been configured for backup twice every week. In addition to data on computers, many users have USB external hard disks and cameras that support USB transfers. ASUSTOR NAS features USB ports on the front and back of the NAS, allowing users to schedule backups from their devices to their NAS. Additionally, users can use the USB 3.0 port on the front of the NAS to pre-configure One Touch Backup from devices to the NAS or vice versa. 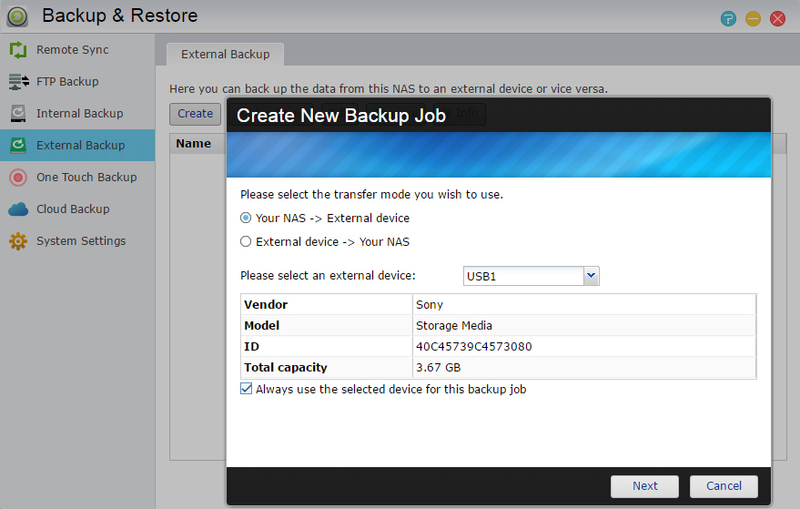 After completing configurations, quick backups can then be executed with just the push of a button. We complete configurations for this task by selecting a backup location, configuring Mission Mode, and setting a schedule. 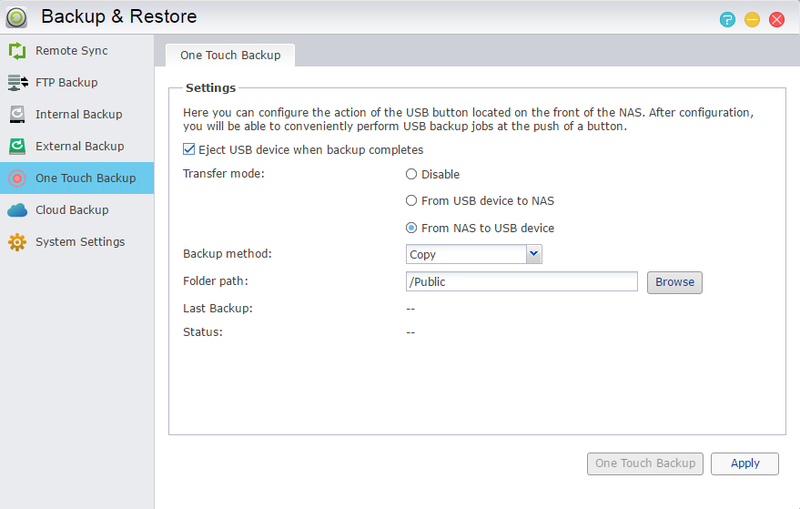 After configuring USB One Touch Backup, a USB device can be plugged into the front USB port for One Touch backups. With the many online cloud storage spaces on the market today, most users are probably making use of these services regularly. ASUSTOR NAS integrates a variety of public cloud storage spaces, allowing users to download and install the corresponding App for them from App Central. 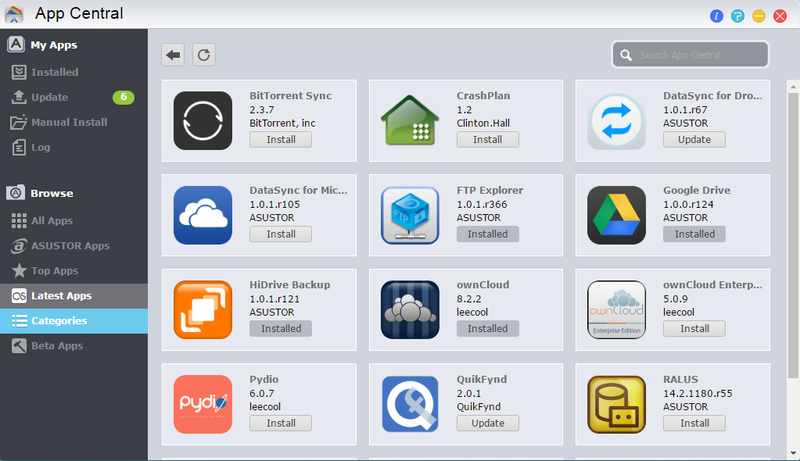 One-click setup allows users to connect their NAS to public cloud storage spaces such as ASUS WebStorage, BitTorrent Sync, Dropbox, Google Drive, HiDrive, Microsoft OneDrive, OwnCloud, and WonderBox. ASUSTOR NAS features built-in Amazon S3 support, allowing users to log in from the ADM interface and begin backup configuration. Users can download Apps for public cloud storage platforms from App Central to begin configuring syncing and backup with these services and their NAS. AiData is a mobile app that provides fast and intuitive NAS file management and is available on Android and iOS.The Android version of AiData supports SD card access giving users the ability to transfer and backup all the photos and music on their phone to their NAS. 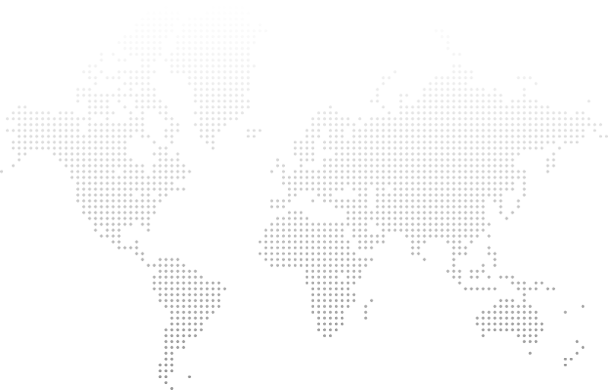 AiData also provides integration with public cloud storage services allowing users to directly log in to these services from the AiData interface. These services include Dropbox, Google Drive, and Box.net. In the modern age of exponential data growth and cloud computing, the number of users of smartphones, tablets, notebooks and computers continues to grow. No matter if it is files needed for work, personal photos, or multimedia, each user’s data continues to grow and spread among all the devices they are using. Even if users choose to rely on popular public cloud storage services to organize and backup their data, capacity limitations and privacy concerns still remain. Because of this, the number of NAS users continues to increase as the NAS offers the advantages of centralized data storage and customizable capacity. ASUSTOR NAS provides a wide range of different management functions, allowing users to easily centralize their data storage and backup. With the basic NAS applications introduced here, users will be able to easily create their own dedicated and secure cloud storage space with ASUSTOR NAS.